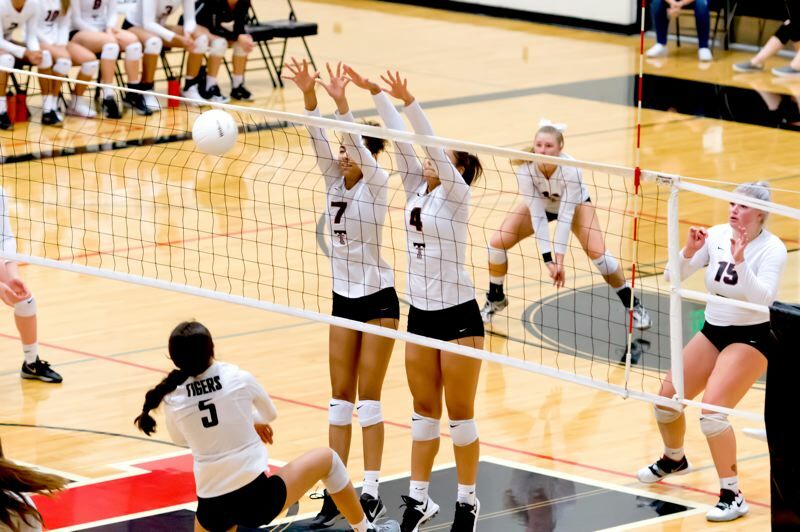 TUALATIN — A fired-up Tigard High School volleyball team certainly came out ready for action. The Tigers, in their first match of the season, roared to a 25-18 win over rival Tualatin. But all that seem to do was fire up the Timberwolves, and they took charge — in a very big way. 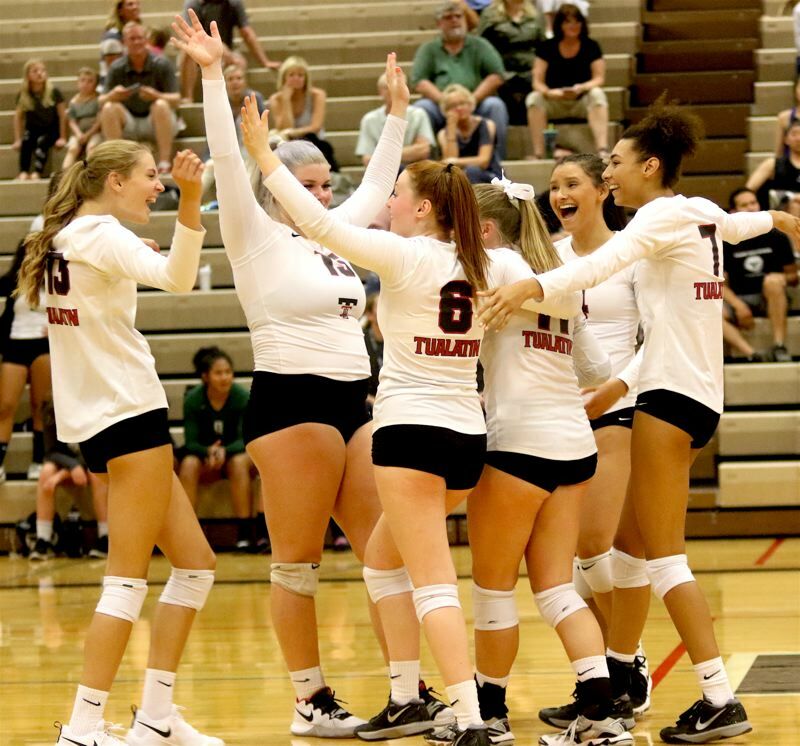 Tualatin, after dropping the first set to Tigard, came roaring back to score an 18-25, 25-17, 25-15, 25-12 win over the Tigers in a Three Rivers League opening match played Tuesday at Tualatin High School. "It was really fun," Tualatin sophomore middle blocker Kylie Zralka said after the match. "Our practices have paid off. Our serves were good. Our serve-receive was good. Everything was good." 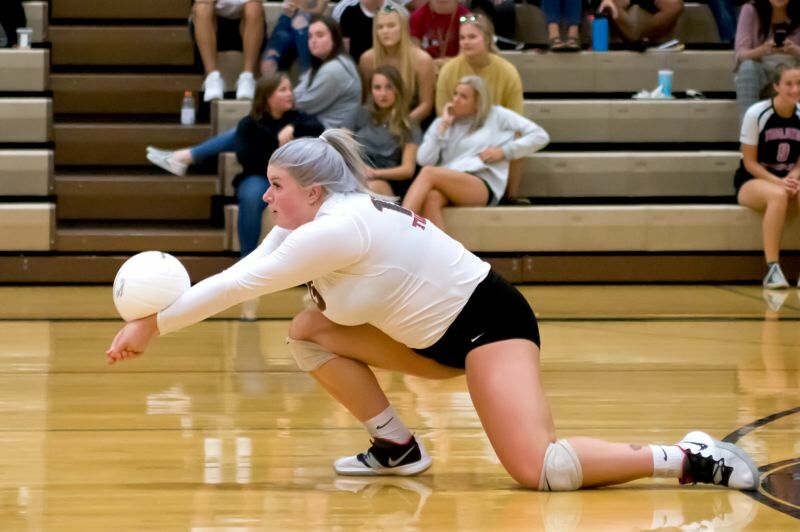 "This was really important," Tualatin senior outside hitter Kendra Zuckerman said of the Wolves' first Three Rivers League match of the season. "We have high hopes for the season and I think coming out with a first win is really important. And it was really fun." With the victory, Tualatin upped its overall early-season record to 2-1. But, more importantly to the Wolves is their 1-0 start to league play. "It was very important," Zralka said. "We want to try and go to state, so this is how we have to do it." For Tigard, Tuesday's match was the team's first contest of the season. "It went well," Tigard senior libero Maddie Hoover said. 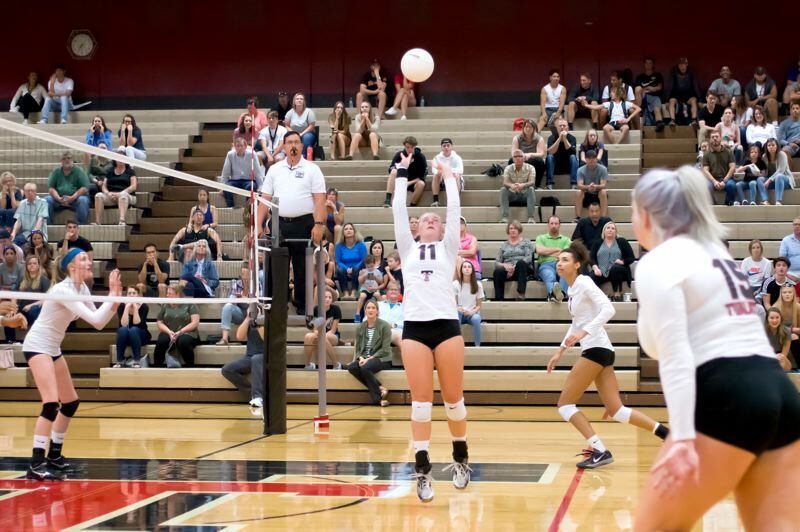 "We were just excited for the season to start, and Tualatin, of course, is super big. They're our rivals. So that was fun and exciting." The enthusiastic Tigers got off to a fast start to Tuesday's match, jumping out to a quick 12-6 lead. Tualatin managed to trim the margin to 13-11, following a dig by junior Olivia Ashley, but Tigard wouldn't let the Wolves get any closer. A kill by senior Meqkylih Smith and an ace serve by sophomore Kennedy Peery helped Tigard push the lead to 19-15. From there, two tips and two kills by sophomore Alison Dreves helped give the Tigers a 25-18 first-set victory. "The first set, we came out a lot stronger than we did the others," Hoover said. "We were all super into it. We were cheering and loud." Meanwhile, the opening-set loss didn't seem to bother the Wolves. "We knew we could win, we just needed to dig deep and focus on our errors, and try to make things better, and we did," Zralka said. "I think we were all just really nervous, and I think it was good that we came back the second set a lot stronger," Zuckerman said. The Wolves answered back in a big way. In fact, they wouldn't trail again the rest of the match. With junior setter Jackie Phillips serving, Tualatin jumped out to a 3-1 lead to start the second set. With sophomore Nicole Ager serving, the Wolves got a kill by Zuckerman and an ace serve to push the margin to 10-3. Tigard, trying to rally, got three straight aces from freshman Kaitlynn Peterson, cutting the lead to 11-8. But the Tigers wouldn't get any closer. With Zralka, senior Addy Crawford and Zuckerman controlling play at the net, behind the setting of Phillips, the Wolves went on to claim a 25-17 second set win. It was more of the same in the third set. With Phillips serving, Crawford had a kill, a tip and a block to help Tualatin sprint out to an 18-8 lead. The Wolves ended up closing out a 25-15 third-set win on an ace serve by junior libero Bella Valdes. From the start of the fourth set, Tualatin made sure Tigard wouldn't be able to claw its way back into the match. With Phillips serving, the Wolves jumped out to a 10-0 lead. Crawford had three kills during the scoring streak. Zralka had two and senior Natasha Loudd added a point on a tip. "Jackie went on a serving run, and that was critical," Zuckerman said. "It was really helpful. Everyone was having fun, and we worked well as a team." From there, Tualatin closed out the 25-12 fourth-set victory, wrapping up the match. "We just knew we wanted to win this match," Zralka said. "It was our rival, and we had the dedication, and we pulled it out." "I think we all just really wanted it a lot more, and we were all really disciplined," Zuckerman said. "Our libero (Valdes) does an amazing job, she's all around, getting the balls up. Jackie is an amazing setter, and having Addy on the outside really helps." Meanwhile, the young Tigard team is looking to learn from the setback. "Definitely, we'll work on some blocking, and more coverages and not let any balls drop," Hoover said. Both teams will return to league action on Thursday. 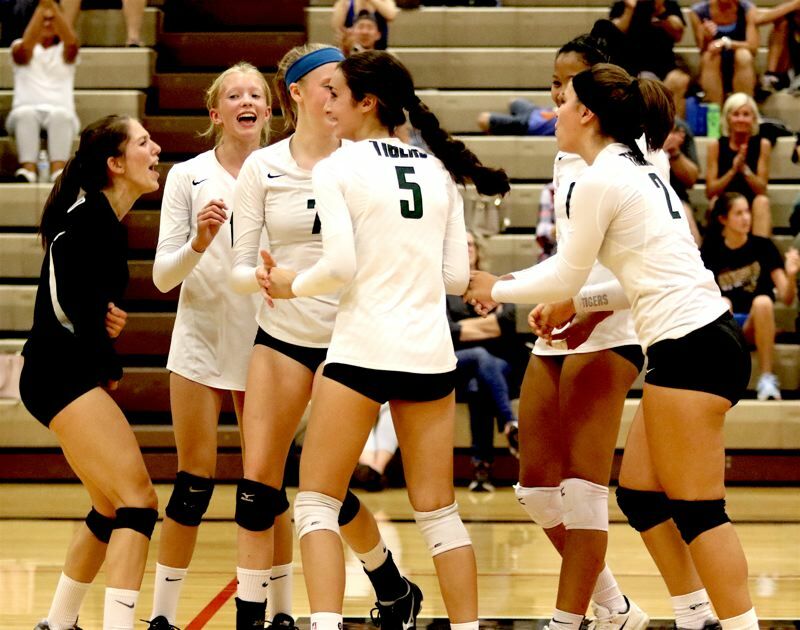 Tigard will travel to West Linn and Tualatin will host Lakeridge in matches starting at 6:30 p.m.
Tigard and Tualatin will have their rematch on Sept. 26 at Tigard High School. "We get another shot at them, and that's exciting," Hoover said. "This was super fun. Next time we'll do it in three," Zralka said with a smile.